Results are now available for the 30 mile, 7000ft long distance trail counter that four from Helsby attempted on a marvellous Saturday just over a week ago. With all four Helsby runners in the top ten a great result for the club, and a 1, 2, 3 from Adair, Ian and Andy showed the effort put in on the day. Outstanding views on the run, so much so that Jackie went to revisit an area she enjoyed after the King John’s Castle fell counter on Saturday, aptly named Pothole Crags (which is essentially the highest part of the Trail up the Beast race). Interestingly the Open to Offas route also takes in part of The Druid , The Lletty, the Llangynhafal Loop and The Beast Races. We’ll probably do some recce’s of the route next year if anyone fancies it. The race series finishes this Tuesday night at Arrowe Park (Cherry Orchard car park), it’s a 6.30pm start, no registration but race costs £1. Prize giving should follow shortly afterwards for those eligible for a prize. Remember it’s the best 3 of your 4 races so worth checking where you stand currently and be aware of the people you might need to beat! Might be worth having some shoes with grip too if the recent rain is anything to go by. 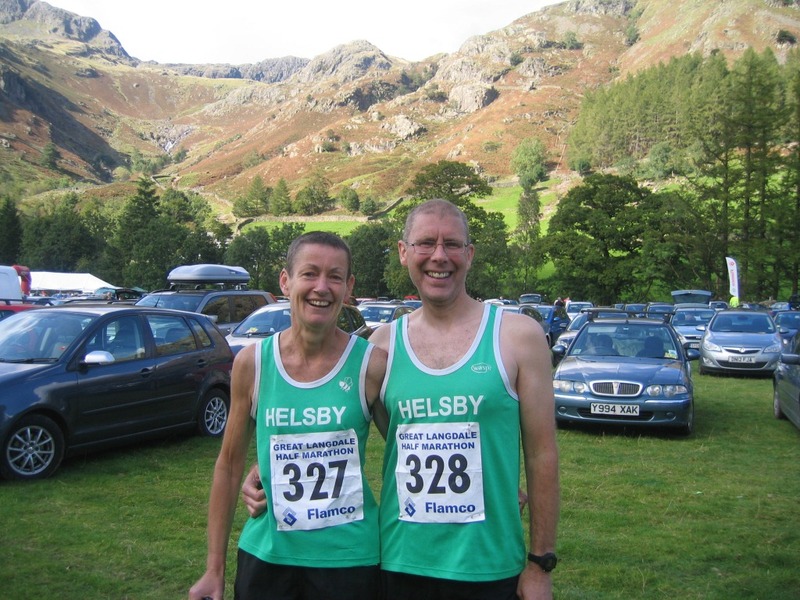 Saturday was the Great Langdale Half marathon, a run that Dave and Lesley have done over the last few years and saw them well up in a field of nearly 400 with PB’s for both, great work. How different the weather was for Saturday and the King John’s Castle Inter Club and Fell Counter at the Raven Inn. Brilliant blue skies welcomed runners and enabled a nice beer in the front of the pub for prizegiving afterwards. The Raven Inn made everyone welcome even providing soup and tea and coffee as part of race entry, another fell bargain at £4. Thanks go to Martin Contrviend and John Linley for organising this race. John had also made some age category winner t-shirts unique for the event. It’s not as tough in terms of climb as some of the other fell races, but was tricky in navigation in parts, and made you work hard in places, so the results don’t tell the full story as some runners will have lost time in parts. There was a stile very early on which was used this year as the farmer would not allow a gate opened but apart from that it’s a good race and thankfully we had Joe and Bill marshalling out on the course where it crossed a road, and supporting in fine voice as always. General feedback was good. Provisional results are already done by Julian who copied them down on the day. It makes interesting reading for those that like stats. Helsby were 2nd on the day and 2nd overall in the series, which is a fair result I think and probably as expected if we go by club size. I think the Druid showed when we have a full compliment of runners we are very strong. Saturday we missed some of our good runners and it may have made things a little closer by the end but overall I hope everyone enjoyed the series and will continue to support the races next year. Of note we only had 9 runners out compared to Spectrums 14. We’ll make sure the races are all suitable to get to this time too! Pat on the back for everyone who did one or all of the races and if you do have any comments on the series please let me know. And we still have more races to go……..
Sunday was the Southport 10k legacy event, have found a website but no results yet, will keep an eye out though and 4 Helsby ran, definitely Roy, Adrian and Helen and have been informed one othe, which gave Roy a 1st v45 and Adrian a 2nd v40, well done guys. I’ll add results to the blog once published. As always if anyone wants to write a brief report about their race then it’l be great to receive them and add a different perspective to the blog.